Turquoise (or Teal) has many shades today. One of them is Holacracy, which is gaining as many supporters as opponents simultaneously. We want to talk about real experiences, implementations in various organisations, with different goals. Are you reinventing your organisation? Or you have some tension, that something could work better, and you are looking for a solution? Let's meet, let's talk, let's learn something from each other, let's inspire. Holacracy Practitioners is a group of people who are tasting holacracy in their daily work and developing organisations, not only during theoretical workshops; we are experimenting, testing, looking for our own path - and we want to share our experience with others. "How to manage in a flat organized, remote and transparent company"
Beyond Business... and back. A discreet way of turquoise. Passionate about discovering humanistic aspects of management. From fascination with technology to fascination with consciousness evolution. Teal approach has always been part of his mind-set. A digital native with strong experience in developing and executing social media strategies for brands. In SoftwareMill Kasia takes care of business communications. She gained her experience primarily in interactive agencies, where she led projects for financial, FMCG, household and HR sectors. Privately a happy wife, cat owner, and bodybuilding instructor. Jakub is a solicitor in an international Polish-German startup PhotoClaim Research based in Berlin, that focuses on claiming the legal compensation for photographers whose work has been used without authorisation. He works as a Case Manager taking care of the formal registry of each case and client compensation. The company works remotely having it’s HQ in Berlin. Jakub has 13 Holacratic roles including Facilitator and Secretary. The company has gone Holacratic in October 2016. Entrepreneur who has built an entire business and worldwide community on top of Open Source software for eCommerce. Lead Link of the Sylius General Company Circle, a group of young and passionate people who catalyse trade with technology. Piotr has more than 13 years of experience in Business Development. During that time, he has built his own company from scratch and helped many others to grow by providing them with software development teams. Scrum believer, open-minded efficiency wizard, and a big fan of ham radio. Responsible for establishing and directing the strategic and tactical goals, policies, and procedures in the area of IT. Experienced in practicing Scrum, nurturing knowledge of Lean, constantly looking for the best of both worlds. Helping organisation, teams and people to grow. Recently filling Holacracy Adoption Lead Role, who leads organisation through the transformation process. 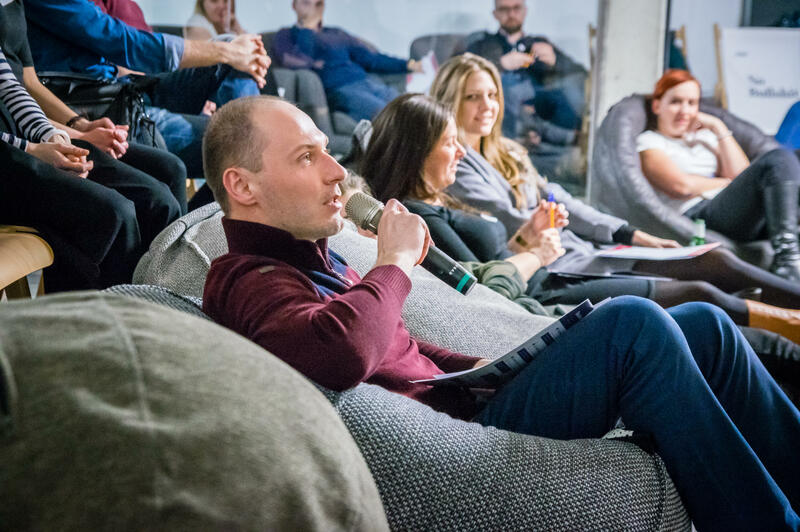 The Holacracy Practitioners Meetup #1 will take place in the main stage of XSolve & Chilid Headquarters, which is conveniently located in the heart of Gliwice, 100 km from Cracow, 30 km from Katowice. XSolve Agile Software House and Chilid Web Agency - both together under one roof building the internet products and solving the business problems of the growing comapnies around the world. We've long been devoted to the idea of Turquoise (or Teal) organisation but we were looking for a framework that will provide concise rules for organizational governance that are clearly understood by all employees – a scalable model, which will enable all employees to take responsibility, develop and grow. During our research, we came across a practice called Holacracy and after months of consultations and discussions we have come to the conclusion that we need to dive in with both feet. Since August 2017 we're holacratic companies. Even if you’re thinking: isn’t it a bit risky? Isn't it just a trend? In a world where lack of employee engagement is one of the biggest challenges to achieving higher efficiency, holacracy might actually be a perfect remedy. The premises of holacracy are trust and faith in individuals and the benefits of those principles offset the risk. Do not stand on the sidelines! Watch, look, be ready for the future of work. If you’re interested in this guide that means you are seriously thinking about introducing change in your organisation or possibly, you already have gone through a transformation. Congratulations, you are at the forefront of inevitable change. How Do You Hire In a Self-organizing Company? As such, Holacracy doesn’t come with a predefined approach to hiring. Each self-organizing company grows their own, custom approach. This article shares one example of the hiring processes in a Holacracy-driven organization based in the Netherlands. Experience, challenges, entrepreneurship and evolution from many different perspectives. It was amazing time spent with all of 85 partitipants. We have many ideas to think of and actions to do, thanks to your engagement. Thank you for your participation!